Over the past week, I’ve filed updates on my progress from the 2013 Pikes Peak International Hill Climb. You can find the practice and qualifying report here, and the final results here. The event was a momentous occasion for Zero Motorcycles and Hollywood Electrics, as this marks the first time a class was formed specifically for Zero electric motorcycles. Below is Zero’s press release commemorating the team’s accomplishments. 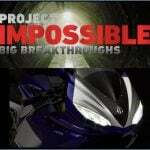 My story about the hill climb will be published to Motorcycle.com in the weeks to come. 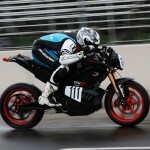 Zero Motorcycles and Hollywood Electrics, leaders in all-electric motorcycles, made history on June 30, 2013, at the 91st running of the Pikes Peak International Hill Climb (PPIHC). 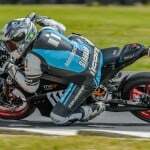 In a historic weekend of racing that saw an electric motorcycle set the fastest overall time in the motorcycle division, Zero Motorcycles and Hollywood Electrics made history of their own with six production-based Zero Motorcycles that all competed and finished with impressive times. Jeff Clark, riding a 2013 Zero FX, was the fastest of the production-based group with a12:00 flat run up the mountain, setting a new record for production-based electric motorcycles and putting him inside the top half of all motorcycles entered in this year’s event. 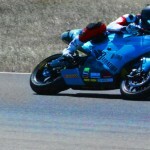 Clark was closely followed by BE-EV.com sponsored rider Jeremiah Johnson, riding a 2013 Zero S and finishing in 12:05. 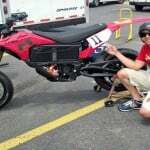 Rounding out the podium with a time of 12:24 in the special Exhibition Powersports Class – Z was Motorcycle.com Features Editor and test rider Troy Siahaan, competing on a 2013 Zero FX. All three finishing times were faster than the previous electric motorcycle record time set by Chip Yates in 2011 (However, the course was not completely paved in 2011 as it is now. – TS). 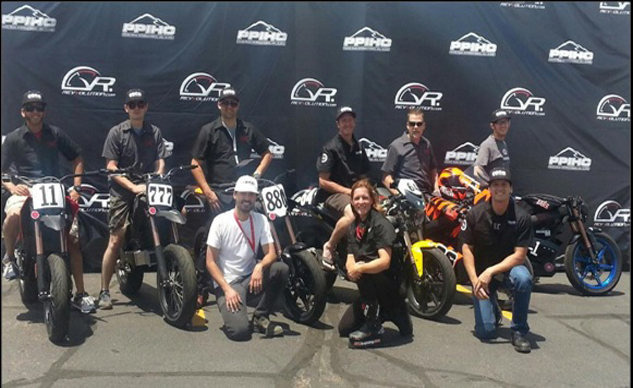 This year marks the first ever Electric Motorcycle Division in PPIHC’s 91 year history. In addition to the top three finishing Zero riders, team members Ted Rich (12:53), Nathan Barker (13:14) and Brandon Miller (13:16) set impressive times as well. Hollywood Electrics organized and managed the efforts with motorcycles and technical support from Zero Motorcycles, represented onsite by Media Relations Coordinator, TJ Aguirre. Hollywood Electrics entered several different model Zero Motorcycles in the event, including a number of stock and modified motorcycles. Hollywood Electrics has been an authorized Zero Motorcycles dealer for four years and is Zero’s number one dealership in sales. The Pikes Peak International Hill Climb began in 1916 and is the second oldest motor sports race in America. The PPIHC is a long-standing tradition in the Colorado Springs and Pikes Peak Regions. The race takes place on a 12.42 mile course beginning at 9,390 feet with 156 turns and ending at the 14,110 foot summit of Pikes Peak. One of the main obstacles of the race is the increasingly thin air that slows reflexes, diminishes muscle strength and reduces the power of internal combustion engines by 30 percent as competitors advance up the peak. The electric motorcycle division has an advantage with the all-electric motorcycles because they do not experience power loss with increased elevation and thinner air. Zero Motorcycles has been working with Hollywood Electrics since they opened their doors in August 2009 as Zero’s first Southern California dealership. This year, for the second year in a row, Hollywood Electrics was named “Top Dealer” by Zero Motorcycles. Hollywood Electrics has worked with Zero Motorcycles and consumers to push the idea that the electric revolution is here to stay. They have been designing and creating custom Zero Motorcycles to provide customers with unique and individualized motorcycles that still offer the exceptional benefits of owning an all-electric motorcycle.